I used this product for my boyfriend party. They look beautiful and everyone commented good things about it. This is a stylish and useful giveaway at an affordable price. Planning to give these to business clients and prospects during the Holiday Season. Very happy with them, great design and already packaged! They feel and look much more expensive than they are. Very nice for our themed event! Using as part of decorations for Awards Dinner taking place during holiday season. I would definitely buy this again!!! This is a perfect wine stopper over the winter months. Great to use at holiday time, too. So simple, easy to clean and it is just fun. I LOVE it!!! Great for gift giving!! Great wine stopper for a little gift for all my wine tasting friends. Gave as gifts to my friends in my Bunco group. They loved them! These wine stoppers are stylish and useful. They are of very good quality for such a low price. I gave them out to friends as a small token for the holidays and they were very well received! A great gift at a great price. It was a great buy to give to my team of 20 people for the Holidays as part of a gift bag. A great gift at a great price and it tied in nicely with our Region's theme. I was very pleased! This will be a special Christmas gift for the friends in my wine class. Pretty & useful, not just a chochkee ! Very nice quality and great to use as a small gift for a large group that I work with- would make a nice party/shower favor. I was looking for something to jazz up the annual holiday wine gifts for the office, and these certainly did the trick. For only a few dollars, the snowflake bottle toppers turned a boring box of wine into something cute and fun. I'm glad I bought a few extras, though--not only will they come in handy for throwing together a quick hostess gift, but I may even keep one or two for myself since they're that cute. Wonderful hostess gifts to include with a bottle of wine :) Glad I bought additional ones because I certainly want to keep at least one for us! I am attaching this to a bottle of wine artfully tied with a matching bow to all my neighbors and co-workers for some Holiday Cheer. I bought these last year and tied them to a bottle of wine for christmas gifts. Everyone loved them. Much better quality than I expected. These wine stoppers were much better quality than I expected for the price. They make wonderful hostess gifts or token gifts that I use for events around the holiday season. When invited to a dinner party I attach it with a bottle of wine. These were totally perfect for holiday host gifts.. Handsome design, simple yet attractive. Gave to friends attached to a wine bottle for Christmas. Clever idea, durable stopper, well made. Great winter party favor idea! Also,so nice to add to a bottle of wine as a winter gift. All my wine drinking girlfriends love them. These make a very posh gift! These are beautiful and totally blew my guests away! This year, I was charged with planning the annual holiday party. Our non-profit college has a teeny-tiny budget for fun, but I still wanted to deliver a top notch event. All the guests raved about these bottle stoppers. They are heavy and well-made. They looked beautiful sitting at each place setting. Cute party favor for a winter themed gathering of friends! didn't use them as a party favor, but rather a nice little touch to the "old standby gift" of a bottle of wine for our friends at Christmas and New Years. Everybody loved them! I saw this wine stopper in a magazine. I ordered 3 and used them to embelish bottles of wine that I was giving as gifts. Got great comments from all recipients about how pretty and practical it was, and also how it jazzed up the presentation of the wine bottle! I wrapped a bottle of wine with Christmas paper and tied the snowflake wine stopper around the top with a ribbon. So cute and usable! It was a great stocking stuffer. These are great. I was pleasantly surprised when I received these. They are excellent quality. Perfect attached to a bottle of wine! It was a perfect gift for my hair and nail ladies. They were truly suprised. It looked so nice wrapped as an addition to a great bottle of wine. I couldn't believe the quality of these stoppers for the price. I used them on bottles of wine for Christmas gifts and everyone loved them. This product was used in gift packages which included a bottle of wine. The response was great. Everyone thought it added a nice touch to the package. Included them in gifts to past clients, staff and business friends, they all seemed to like them. I gave this is a gift with the snowflake votive candle and everyone loved it. I got one for myself too - it's very cute for winter wine drinking! This wine stopper was perfect. 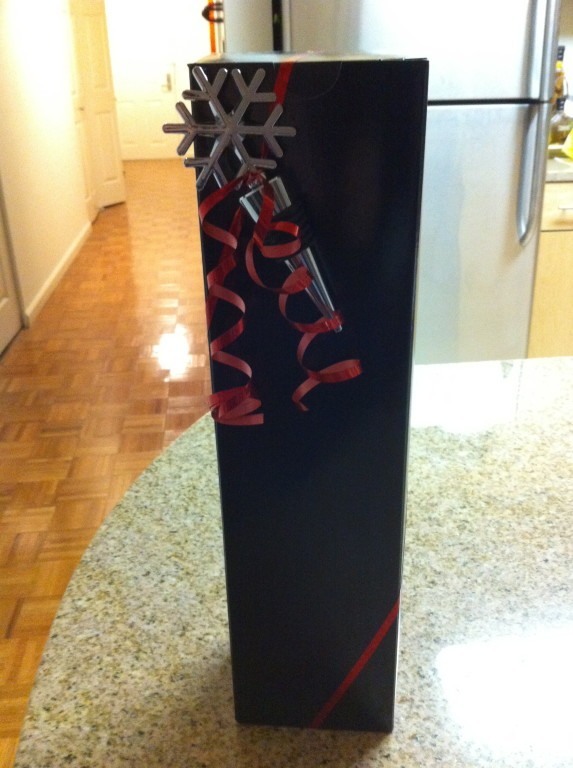 The snowflake design made it an appropriate winter holiday gift tied to a bottle of vino. Thank you. The perfect Office Holiday gift. I came across the snowflake wine stopper by accident and have to admit that when I saw the price, I thought they would be "cheap" looking. When they arrived, I was pleasently surprised. They were the "best" holiday party favor we have ever had. I would buy this again and again. I was pleasantly surprised at the quality of the Silver Snowflake Wine Stopper. At the price, it made a marvelous gift and added a little welcome glamour to my own holiday table. I will continue to check the Beau-coup Web site for more interesting deals. Thanks! It was a great small gift that we had as take-away gifts. Felt solid and I loved the individually wrapped boxes with bows! We bought these items for gifts at Christmas....both of my college age daughter gave these as gifts to multiple friends..great for such a reasonable price. Recommended to a friend she too bought for Christmas gifts. Plan to order wine stoppers for table gift as wedding shower. I bought this as a small present for the people at the office as a small Christmas present, was a great gift, presentable, and professional! You can't go wrong with it. I used this wine stopper tied with a bow to a bottle of wine for hostess gifts this Christmas. I was very happpy with the price and quality of this item. My husband makes wine at home. These stoppers were tied to the neck of wine bottles and given as Christmas gifts. They were attractive and made a great gift. I will buy different designs with every season. These made great holiday gifts for my team! We used these wine stoppers for favors at our law firm's holiday party. Big hit and very reasonable price. I used these wine stoppers as a little something extra to go along with my holiday cookies and goodies that I was giving to coworkers. Everyone loved them! The loose snowflake comment was because some arrived and I had to tighten them before I gave them to my family and friends. I only hope they don't break while in use. I think the snowflakes just screwed in to the bottle stopper part, but it still made me kind of nervous. Overall, a great gift with a bottle of wine. Perfect. Bought this for my girlfriend -- she absolutely LOVES IT!! Has also received many compliments. This product was great, especially for the price. We gave them as gifts plus kept a few for ourselves. Our friends loved them! The design is great for all winter long, and it is durable enough to use year after year. I purchased these snowflake wine stoppers to give as holiday gifts. I tied them to the neck of wine bottles and wrapped the bottles with matching snowflake giftwrap. Wow! These gifts were showstoppers!!! Affordable and gorgeous! I added these stoppers to bottle of Wine for Holiday Gifts. It was a great touch to a simple gift! Turned out to be an excellent party favor for the adult guests at our Christmas party. We used these snowflake wine stoppers as favors for our "winter wonderland" themed company holiday party. They're a great value and came packaged which was very convenient (no assembling). They look more expensive than what they cost so we were able to give out a nice favor on a tight budget without compromising. This company is great -- love the site design! Best Christmas Gift I Gave This Year! This was an awesome find (thanks to Better Homes & Gardens) and was a hit with everyone that received 1 with their bottle of wine. It's different, it's whimsical and a perfect "hostess gift" to keep on hand all year long. We bought a box of 10 and I will definitely be ordering others. Saw this in a magazine. I ordered several, as I was going to a wine tasting and thought it would be great to hand out to everyone. It was a HIT! SO cute and just the perfect touch! [...] Beau Coup has the best choices and the prices are great! The wine stoppers were included with a bottle of wine as holiday gifts for my management team. They made the gift even more festive. The team loved them; received many compliments. Thanks for making my holiday shopping easier! I purchased this at the last minute as part of a hostess gift for a holiday brunch with friends. [...] Some have even called since the brunch to ask where to buy them. They were the perfect holiday gift for everyone and can be used throughout the winter and not just during the holidays. Now my only dilema is how do I find a gift next year that is just as good for the price? Thanks for helping to make my holiday brunch the day after a one of the biggest snow storms in my area a success. I wrapped these with a piece of ribbon on a bottle of wine. the gifts were well recieved thanks ! I bought this product and tied it on to a bottle of wine and gave it as a hostess gift. It was eye catching and unusual. Each time I gave the bottle stopper tied with a beautiful ribbon to a nice bottle of wine I had fabulous compliments. No one would guess that it only cost [$]! I love this affordable wine stopper. I bought many so I will have them for a while through many holidays. Great Gift! The Snowflake winestopper and the snowflake coasters make wonderful gifts. The snowflake wine stoppers are truly a fun gift or home bar item at an extremely reasonable price. Saw this item in a magazine & immediately came home to purchase online. I was not disappointed and neither were the friends who received them as a gift! These wine stoppers were the hit of the party. Everyone thought that we had paid a fortune for them. We used them as favors for the ladies at our Lions Club Christmas Party and everyone just loved them. They were package perfectly and the committee did not need to do a thing but hand them to our guest. Ordering and receiving them were an ease. These look much more expensive than they were- I gave them out to friends as little holiday and hostess gifts and they were a big hit. I gave these to my "breakfast club" friends with a bottle of sparkling grape juice in a pretty material wine bag at our Christmas exchange. These bottle toppers were the perfect "bling" addition to the gift. Of course I bought one for myself. These stoppers are so cute and what a great buy!!! They are great! Great Value for the price !! I am going to attach these to bottles of wine with ribbon for gifts. The bottle stopper adds a little something special to the gift. Love the snowflake, great for all winter long entertaining. Wonderful Favor for Holiday Party!!! This was used as a gift for a Holiday Party. Everyone loved them! Adorable and for a Great Price! I bought this, as well as the snowflake glass coasters, and along with a bottle of wine, made the perfect holiday hostess gift for anyone! Adorable wine stoppers and GREAT price... looked so much more expensive than a couple of dollars... we had custom wine labels done and tied the stoppers with ribbons around the bottles, for a very cost effective, useful and personal gift! My guests loved this wine bottle stopper and thought I had gone waaay overboard. I hadn't - these great party favors only look expensive! I purchased several as stocking stuffers for Christmas. At first I was a little disappointed as the snowflakes were all "loose". I realized they screw off but did not see any options on the website for replacements if you wanted to interchange them. For the price--a good purchase. We bought several of these to give as gifts to guests that attended our Christmas party. Very inexpensive, but have the look and feel of top quality merchandise. With a cute box at the dollar store, you're only paying a few bucks to make this a well-received gift! I bought these snowflake wine stoppers as table favors when I hosted my holiday bookclub dinner. They looked great on the table and everyone loved them. A festive, practical yet inexpensive way to show your guests you're glad they came. Every holiday season, I make my own Irish cream type liquor to give as gifts for friends, neighbors and clients. I use decorative glass bottles that come with generic cork stoppers (which are discarded). I decorate the bottles with dry-erase pens so that they can be cleaned and re-used. I tie a beautiful bow around the neck and sometimes include a little charm or ornament. As the showpiece, I always use a holiday bottle stopper, which everyone has come to expect and collect. I try to limit myself to around $15 or less per stopper. These stoppers were so beautiful - and so inexpensive! I would have gladly paid much more for them. I received nothing but praise and compliments from all who were in receipt. Thanks so much for a great product at an exceptional price!!! I ordered ten snowflake wine stoppers to give to the girls in my family for Christmas. They are nice and heavy - good quality. The only thing that bothered me a little bit was that they seemed a little too small for the wine bottle. If you knock over the bottle, the stopper will fall out. It's not a snug fit. But it does look nice in the bottle. I bought these wine stoppers for our holiday party and for my coworkers. They loved it!! They're very affordable with class. I used this item as one of the prizes for our group's Christmas party games. It was a hit for those people who do not regularly finish a bottle of wine in one sitting. It's very sleek, stylish, easy to wrap and carry, very appropriate for the Christmas holiday theme. We gave out these darling wine stoppers as favors for our corporate party. They are super cute, and looked beautiful in the clear favor cones with sparkly fake snow. The only drawback to them is that the rubber ring that should seal the wine bottle is very narrow. Due to this, the stopper slides too far into the bottle and doesn't actually seal your wine. I just received the snowflake wine stoppers and even after reading the positive reviews, the style and quality were beyond my expectations. Also, the entire purchase process was a good experience. My guests are going to love these! I purchased these as party favors for a wine tasting holiday party. I was worried that they would not be heavy enough or may appear cheap, but I was very pleasently surprised! They are solid and look expensive. Incredible value for the price. Looks more expensive than it is!! What a great presentation this snowflake wine stopper gives...It's heavy, attractive, impressive and looks much more expensive than it is. I was searching for an affordable favor that still would make a statement. Eureka - I found it. This pretty favor looks expensive but does not break the bank. Plus it makes a statement. This is PERFECT! This is a great gift for parties... high quality and reasonably priced. Q:What is it made of? A:This item is made of a plastic. 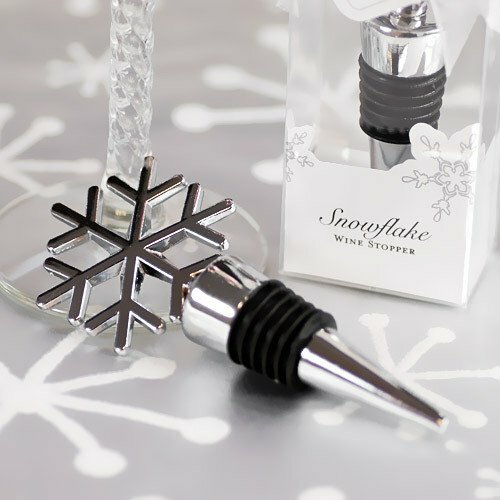 Dazzle your guests with these snowflake wine stopper favors perfect for a holiday party. The stylish chrome snowflake topped bottle stopper is an inexpensive way to thank your holiday guests. Also great for corporate events. Each stopper measures 4.38" in length from the tip of the stopper to the top of the snowflake. Each stopper comes packaged in an elegant white gift box adorned with matching snowflakes, blue ribbon, and a gift tag that says "Thanks".